The Ashram's heath initiatives have grown organically over time to serve the needs of the local population balanced with the capabilities of the Ashram. In 1987 the Ashram conducted its first Eye Camp under the blessings of Param Pujya Bapuji and these continued on an annual basis. In 2006 a purpose built Eye Hospital was constructed in Sayla town centre: The Kashiben Harkisandas Sanghrajka (KHS) Eye Hospital. The Eye Hospital is equipped with the latest PHACO machines and currently conducts approximately 3500 cataract operations every year. This includes surgery for glaucoma, pterygium and corneal relaxing procedures. There are two full-time ophthalmic surgeons Dr Kamalbhai Shah and Dr Vidhyut supported by their team of staff. Over the past 11 years, 186,300 patients have been seen in the out-patient department and over 29,965 operations have been undertaken. Click on the video link here to view an insightful introductory video on the Eye Hospital and Dental Clinic. 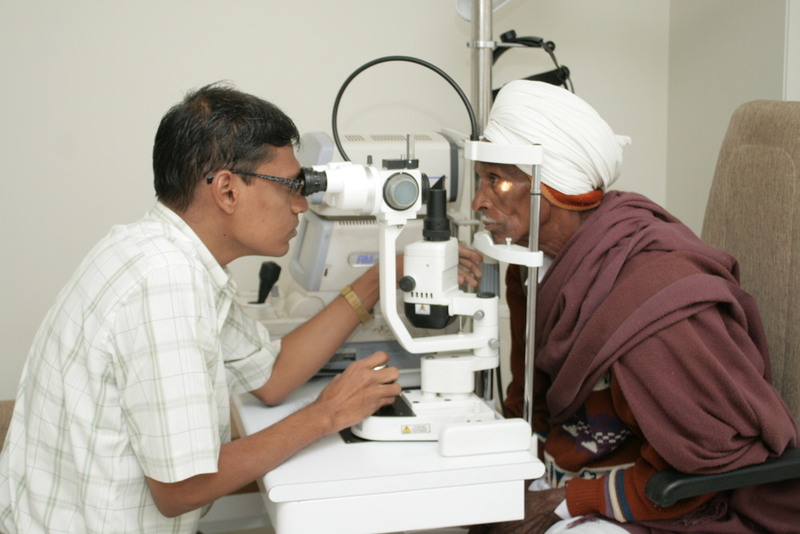 "I joined this Eye Hospital at its inception. When I first visited Param Pujya Bhaishree and Raj Saubhag Ashram, I was overwhelmed by observing the unique combination of spiritual and social causes. I realised that by working here, I would be able to achieve a spiritual growth in my life through my professional work. No feeling is better than to give vision to the blind and needy people in this rural area. We started our Eye Hospital as a small unit, but with the blessings of Pujya Bhaishree, we are giving the best of the best eye care to thousands of patients in this rural area, it is on par with any metro-city, and we are still growing. Giving eyesight to the poorest of the poor people is the only passion that drives us to work harder and harder." Raj Saubhag Ashram proudly opened a state of the art dental surgery in July 2010. Previously, the nearest dental surgery was in Surendranagar an unaffordable distance for many to travel to. The modern clinic is equipped to a high standard with a sophisticated dental chair, X-ray unit and autoclave. Dr Sharma is the full-time dental surgeon based here. Camps are being held monthly where patients are seen free of charge. Many of the Ashram’s volunteers who are dentists in Mumbai and Ahmedabad such as Dr. Komal Shah and Dr Aarti Shah - support these camps bringing their time and expertise to Sayla at no cost to the ashram. Last year 5310 patients were treated at the surgery. In 1998 Raj Saubhag Ashram opened a general medical dispensary to provide medical advice for those who could not afford private services. Demand was high, with 80 patients seen every day. In 2008 the State Government of Gujarat requested the Ashram to take over the management of the poorly performing Sayla Community Health Centre (CHC). Services at the dispensary were closed and attention was shifted to focus on the Community Health Centre. 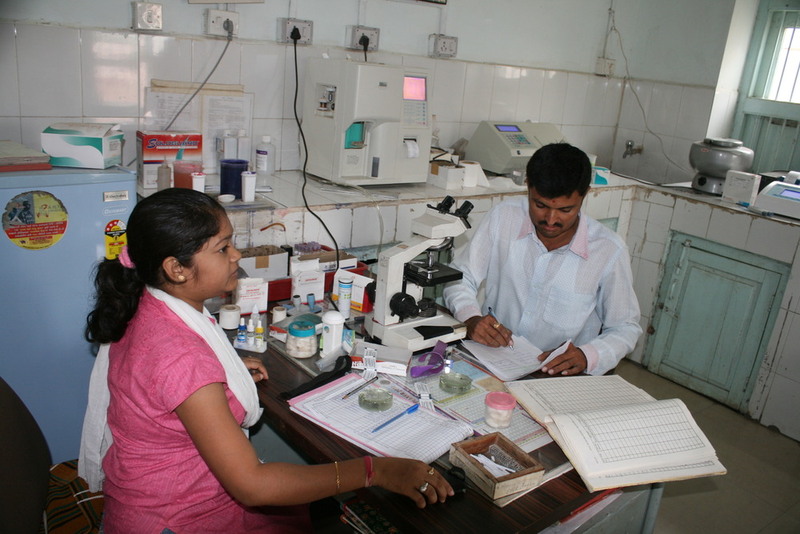 Today Sayla CHC provides services for the entire district of 75 villages and a population of over 120,000. The Ashram refurbished the facilities and provided additional medical services that were not previously available. The Ashram now manages the centre with the government contributing part of the running costs. The centre provides basic emergency medical services and has expanded to include 4 medical officers, a surgeon, an obstetrician, 7 nursing sisters, 15 paramedical staff, a pharmacist, 2 lab technicians, a radiographer and 4 administrative staff. Since the change in management, the number of patients seen in outpatients has risen from 150 to 300 per day and new born deliveries have increased from 5 a month to over 80 a month. In the past year, 75,000 patients were seen as out-patients, 2400 x-rays were taken, 900 babies were delivered and 3950 surgeries were performed. Charges for registration and treatment are as per government regulations and heavily subsidised. In the paediatric department Dr Masrani examines approximately 50-60 children daily in the outpatient department. Emergency services are provided around the clock. Sayla CHC has been classified as a ‘New Born Stabilisation Centre’ and also has a Child Development and Nutrition Centre for malnourished babies. Click on the video link here to view an insightful introductory video on the Sayla Community Health Centre.